This is an English translation of Arthur De Grave's interview in French. Cross-posted from OuiShare. Translation by Clement Defontaine. 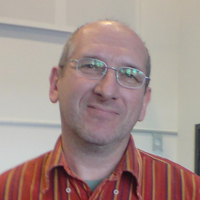 Michel Bauwens is one of the pioneers of the peer-to-peer movement. Theoretician, activist, and public speaker, he founded the P2P Foundation in 2005. His work, both rich and complex, is built around the concepts of networks and commons, and lays the conceptual foundations of a production system that would serve as an alternative to industrial capitalism. I had the opportunity to meet him at the French release of his latest book, Saving the World: Towards a Post-Capitalist Society with Peer-to-Peer (published by “Les Liens qui Libèrent”). Michel, Save the World, your last book, is the translation of a series of talks with Jean Lievens published two years ago. What happened between then? Do you have the impression that the transition you talk about has accelerated? In this regard, one should make haste slowly. It is clear that the transition to a post-capitalist, sustainable economy will not happen overnight, or even in a few years. It is a long process. Some projects which seemed to work well according to a peer-to-peer logic one or two years ago have since become purely capitalistic. This enables them to grow faster. It contrasts with other more open and truly collaborative projects that have chosen to grow more slowly. When one has no money, one takes on "solidarity dynamics". So yes, it can give an impression of a relative stagnation, but I do not worry too much. For this is a major crisis, ecological, social and economic, looming on the horizon. The challenge is to be ready when it breaks out, probably around 2030. FairCoop, WikiSpeed… These kinds of projects are still small and yes, too few. In the coming years, those who are still only the seeds of this transition will have to develop a stable ecosystem, in order to initiate a real movement. In an interview with us in 2013, you stated that capitalism and peer-to-peer were still interdependent. Isn't that the real problem? Is this a stable relationship? No, of course not, how could it be? The value generated by the Commons is still largely captured by capital: by adopting extractive models, large platforms of the sharing economy are engaged in a form of parasitic commercial activity. In the old days, capitalism was a way of allocating resources in a situation of scarcity, but now it is an engineered scarcity system. Our system is completely mad: we pretend that natural resources are endless, and we set artificial barriers around what is abundant in nature, i.e. : creativity and human intelligence. This is a profound moral issue. In her book Owning Our Future: The Emerging Ownership Revolution, Marjorie Kelly aptly defines the challenge that awaits us: moving from extractive capital to generative capital. The good news is that this process has already started. First of all, because it is impossible to hide the fact that civil society has now become a value creator. This is an important point, as civil society was mostly absent from the "classic" capitalist equation. In addition, we are beginning to witness a change in market structures: commercial spheres of a new kind are developing around the Commons. Enspiral [a collaborative network of social entrepreneurs], in New Zealand, is the perfect example of this type of entrepreneurial coalition. In your opinion, how could the peer-to-peer model free itself from capitalism in practical terms? For a start, we should choose the right strategy. I think that despite all the good intentions, projects that aspire to compete head-to-head with Google or Facebook are doomed to fail. I believe much more in targeted approaches like Loomio [an online tool for collaborative decision-making, editor's note]. The transition will be a sum of such small victories that will connect with each other. This also requires the creation of new legal tools. We have completely forgotten the tradition of Commons and this is really obvious in our legal tradition. We must make room for legal innovation. In this regard, a principle like the copyleft, or the opposite, the copysol [a license that prohibits any interaction with the traditional commercial market, editor's note] are interesting but imperfect as they are too radical (in their implications). I want to find a third way, one that would provide a balance between the commercial sphere and the Commons. This is the goal of the work we began around the notion of Peer Production License, which balances out contribution to the Commons and use of these. No revolution ever happened without a fraction of the ruling elite take the side of progress! This means that a cultural shift is needed. Today, Joe Justice [founder of the Wikispeed community] struggles to raise funds, including from ethical finance funds, as Wikispeed does not file patents. The world of responsible finance can not continue to support models that create artificial scarcity. As I was saying earlier, when one lacks resources, one works with other people. For initiatives of the Commons economy, building a network is an absolute necessity. To get an idea of what this kind of ecosystem might look like, go to Madison, Wisconsin: there, food cooperatives, cooperative credit systems between companies, time banks, etc. gathered to create the Mutual Aid Network. In Madison, the alternative economy can be seen and felt in the streets and took less than two years to happen! The same kind of ambition drove an initiative like Faircoop in Spain. For now, the main transformative ideas that are penetrating the economy - open economy, solidarity economy and ecology - are applied independently from each other. But when these ideas converge, we will witness the birth of an open source and circular economy. This concept of Open Source Circular Economy is at the heart of the debate we are conducting within the P2P Foundation. I have the feeling that, by focusing on economy and leaving aside the political processes, we have given in to the calls of technological solutionism criticized by Evgeny Morozov. What do you think? Should we relearn to do politics? Yes, in some ways, but what matters is that politics ended up re-imposing itself through collective learning. The Commons Transition Platform in which I am very involved, gathers and details the political transformation plans necessary for the implementation of a post-capitalist society. This is also the idea of the approach we applied with the FLOK project in Ecuador. The devised political transition plan which included civil society at the centre of public-value creation, a market sphere integrating external factors and a State that serves as a facilitator. FLOK was a partial failure, due to a lack of political will and lack of social base on which to lean for support, however, the political vision we have outlined is making its way to Europe (some proposals have been included within the economic program of Syriza in Greece). Occupy Wall Street and the Indignados eventually lost momentum. The Arab Spring was, for the most part, led astray. In Spain, Podemos movement attempts to maintain a balance between bottom-up and vertical power, but at the expense of permanent tensions. How can one overcome the contradiction between the institutional logic intertwined with political practices and horizontality, a concept cherished by social movements? To transfer a concept in real-life conditions on the long term following a pure horizontal logic is very complicated, if not downright impossible. At one time or another, a collective entity has to intervene to transcend individual interests. This also forms part of the collective learning of politics that we had to do. This is also the goal of Podemos' experience in Spain. A fully horizontal organization system causes too much energy loss; conversely, the vertical system should be confined to areas where it guarantees a greater degree of autonomy for everyone. A bit like the Domain Name System when Internet appeared. Are the Commons a left-wing idea? Politically, the P2P Foundation is a pluralistic organization, simply because the logic underlying the Commons spans the entire political spectrum. Solidarity also exists within right-wing parties, some ideas in the ideology of the Front National (French extreme right-wing party, translator's note) could even be considered as more socialist than what the Parti Socialiste (French socialist party, translator's note) offers today. But the real question is: who benefits from this solidarity? Right-wing parties only show real solidarity with their supporters! So it's on the issue of inclusion that the real fault line between right and left comes to light. It is on the issue of inclusion that the real fault line between right and left comes to light. Personally, I have left-wing ideas, and I think that the transition to a Commons economy has to benefit to everyone. The real challenge is to go beyond the progressivism inherited from the world of work of the last century. In this context, it is not surprising that European socialism is going through a profound identity crisis. It is true that none of the partisan parties really seized this idea of Commons. Was it a mistake? Can we really make this a political topic? The concept of Commons remains somewhat abstruse. The jargon of the Commons may at first seem technical and hard to digest, which is true. But in the mid-2000s, when I created the P2P Foundation, I decided to completely give up the old political lexicon of the left. At that time, the public did not really know what was hidden behind the concept of peer-to-peer. But as social and cultural practices started evolving, as networks started being used on a daily basis, more and more people adopted this new language. The same will most likely happen with the terminology of the Commons. All will depend on the social movements that will defend this original conceptual arsenal. However, I find you rather pessimistic: the Pirate Party, the European Greens, Podemos, or Syriza have largely embraced this concept of Commons. It is indeed at the core of a new progressive thinking. Politicizing the Commons, is researching their roots and genealogy. If the law leaves so little room for the Commons today, it is because we forgot where they came from. Yet, this type of organization and management of resources existed long before modern industrial capitalism practices. We must reconnect with this tradition and rewrite this forgotten chapter in our economic history. Politicizing the Commons is also researching their roots and genealogy. It's the condition to lay the foundation of a new narrative on progress. Changing the world for the better will require considerable efforts on the part of everyone, but I think that peer-to-peer is a vision of society that is worth the sacrifice. Tip of the Hat to Jean Lievens. This is an English translation of Arthur De Grave's interview in French. Cross-posted from OuiShare.